I have always been cheap. Umm, let's rephrase that...I have always been thrifty :) Ever since I was young, I learned to save up money for what I wanted and learned very quickly how far money didn't go. My mom used to give me an allowance. Every week, I would get my age in money if I did my chores. It was a great deal, but it quickly went to clothes because my mom also had a thing that I had to buy my own clothes or wear the ones she buys and chooses. I love my mom, but she had the absolute worst taste in clothing for me. Horrible. So, I learned that I needed to save my money and spend my money very wisely. I realized quickly to never pay retail for anything. Fast forward to my teens, and I started working at Dillards. This really made me realize the huge markup on everything. Like thousands of percentages markup. Serious. I would wait for something to go to the lowest clearance possible, wait for an extra discount day, and then buy it with my employee discount. I would get something that retails for $400 for about $50. If I wasn't ruined already from never buying anything retail, this did it. It also gave me a threshold for the amount I would pay for certain things. Nothing has changed now that I'm older. I probably have more refined tastes, but I still search for the deal. My clothes never come from a department store, in fact, I never step foot in malls anymore. They make me cringe :) That's not to say you can't find good deals there, I just can't stand them. 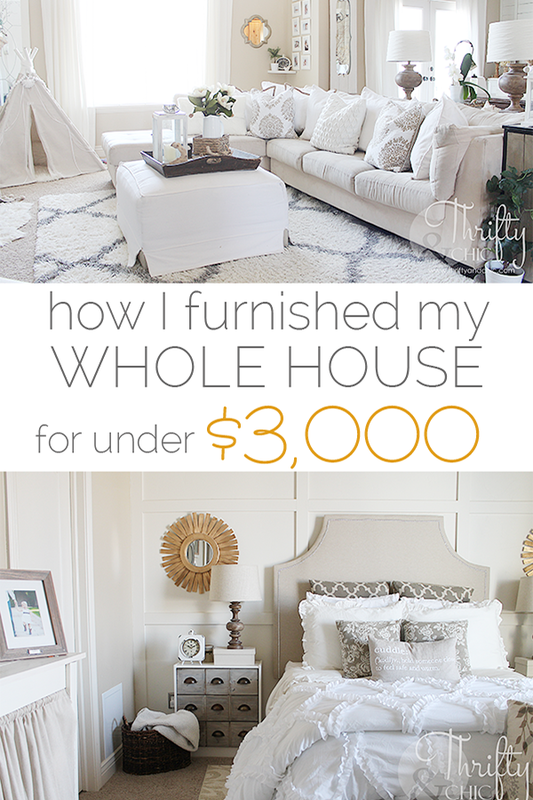 I have learned a ton through the years when buying furnishings for my house also. Where to shop and to wait. You can't curate a whole home worth of furniture overnight, if you do, it might cost a little more than if you waited to buy the perfect pieces as time allowed. 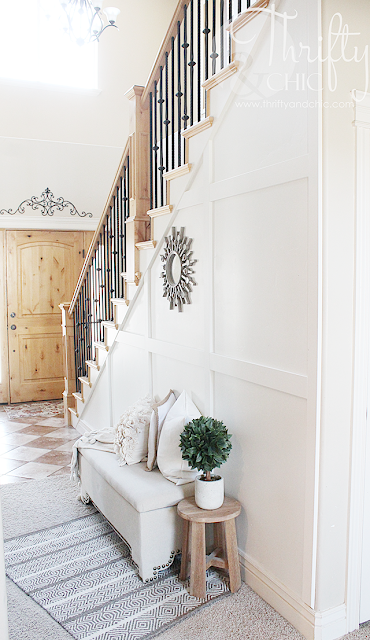 You can make a house beautiful without spending a ton of money, and here's how I did it. #1. Find the stores that fit your aesthetic, and shop their clearance. Target is my favorite, and their clearance is just amazing. You have to shop the end caps weekly, but can usually find a worthwhile deal. Especially online. #2. Shop sales and promo codes. Wait for the promotions to come on the item you most want. Target online is once again awesome for this. I also saved about $300 on my sectional waiting for a weekend sale from a local furniture store. #3. Shop furniture warehouses and clearance centers for large pieces of furniture. I got my couch for $90 at a clearance center! (Many of you have asked about what store, it was RC Willey's clearance center). #4. Shop discount retailers such as Home Goods, Ross, and Gordmans. #5. Keep an open mind to free things from family and friends. Most of my stuff is from family or friends just giving things away. #7. Shop thrift stores and yard sales. I actually don't do this often, hardly at all, but you can get some great deals sometimes! My mother-in-law bought a nice fire pit with 4 chairs for $5 at a yard sale!! Serious! #8. If you can build it or make it, do it. This will save you so much money! 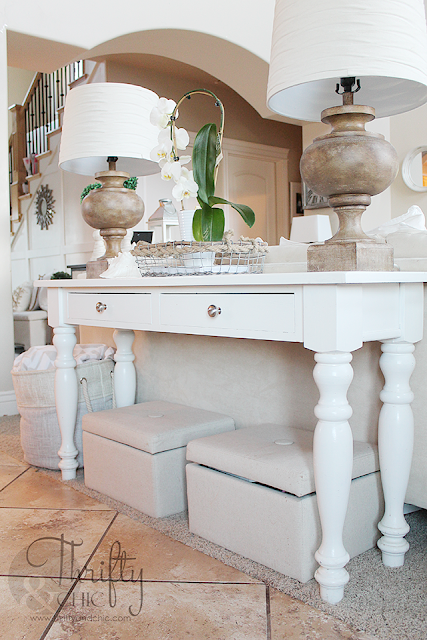 Okay, now that you know my shopping secrets, here's the breakdown on my house furnishings. And to be clear, this does not include any of the decor, just furniture. I do have a little break down for the decor pieces at the end though. My house is 3500 square feet with about 2000 square feet of livable space. It's 3 bedrooms, 3 bathrooms, a front room, a living room and dining room. Favorite place for curtains is Ikea. All my curtains are from Ikea, they come in 106 inches which is what I use. I found most of mine for $20 a pair years ago. I think they are a little more expensive now. From Ikea also. Large frames are about $7 and small frames are about $3/4. Most from Target and Home Goods. Thank you! Lots of furniture stores have warehouses they put scratch and dent or outdated furniture. They are usually on the outskirts of towns :) Oh, just clearance centers too. They may be called different depending on the store. Hope that helps! Ours are called Furniture closeout stores. One of our largest furniture store here in Virginia has them. Funny you are right...ours is on the outskirts of town too. Your home is beautiful. I have been following your blog for awhile and really enjoy looking at all the small details. Could you please tell me the colors of the paint you used in your living area for the wall and trim. Thank you so much. Thank you! I wish I knew the trim color. Both colors are just builder colors. Water Chestnut by Glidden is the closest I have found to the wall color. I haven't had to paint/match the trim yet, so I'm not sure what color that would be. Just like Monkey, can you give us an idea what you mean by furniture 'warehouse'? I'm new to your site (and I love it)! That being said, do you have posts on kitchen redo/updo/update? (:-P I have one on the very near horizon.
" Lots of furniture stores have warehouses they put scratch and dent or outdated furniture. They are usually on the outskirts of towns :) Oh, just clearance centers too. They may be called different depending on the store. Hope that helps!" Thanks Alicia . . . Now I read you loud and clear. FYI: Our kitchen has been at the "beginning" conversation for years; we just could not agree on how much to 'rearrange it' from where things are now. Hubby isn't a big change lover and I sorta' thrive on it. I think I just plain wore him down - like water over the rocks! Finally in agreement through compromise, we're moving forward. Now I am the one gathering those last ideas "before the bulldozing" starts. Don't want to miss great ideas like you have! Wish us patience (and luck). Love everything! What do you mea, free from blogging? Sorry! I had to clear this up by changing it to having received a few things from my sponsors. 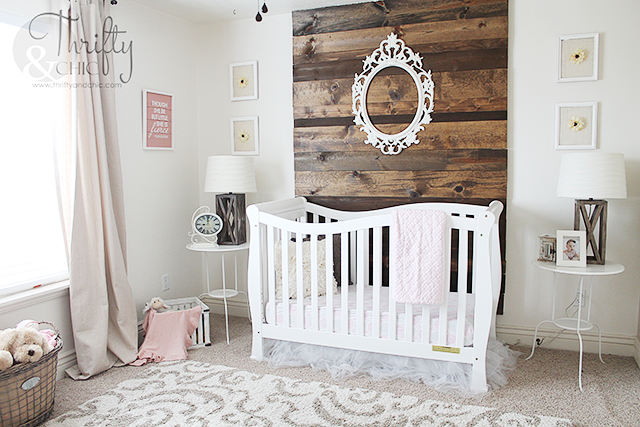 Like the chairs and bed frame in my little one's room. You certainly have an eye for design and decor, your home is fantastic. Wish I had a Hobby Lobby close to me, but the other stores are all in my area and of course online. 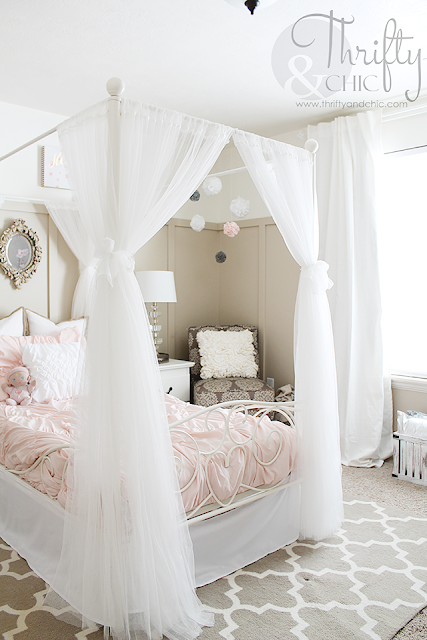 The girl's bedroom is adorable. Thanks for sharing. You are seriously my home decor soulmate. All white, Reclaimed, on sale & hints of Glam! Love it all! check out my website to see how I did this (on a much smaller scale than you of course ) :) . Wow! So inspirational! Thanks for sharing. A girl after my own heart! Don't forget antique shops and antique malls - if you can get outside a major metro area, prices are very reasonable, and you can find lots of truly unique pieces with character to either paint/refinish or leave as is. If you can develop a good eye for proportion and scale, you will know when something has "it". 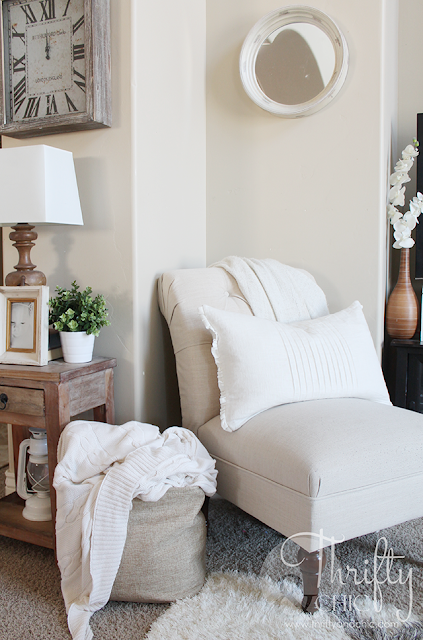 Fill your home with the things that have "it" and your rooms will be gorgeous, no matter what the style. Do estate sales instead of yard sales. Saturday is 50% off and Sunday is 75. You'll never go to another yard sale again. Everything looks lovely but since you got a ton of it for free I don't think you can release say you furnished your entire house for $3,000! Still a great post though! Thanks! If that is all she personally spent, then she DID absolutely furnished her house for$3000. If you get something free,do you pay $ for it? The average person doesn't have sponsors...so while it's great that she was able to do so, most of us...cannot. Hi 'Nelle, I actually just cleared this up in the post. The few things I received from my sponsors only add about $250 to the amount, so it's possible to do it under a $3000 budget! I love the rug in your living room but I can't seem to find the exact one on the RUGSUSA website. Do you recall what it was called? Thanks!! Love your home!!! Do you mind sharing which online sale you got your ottoman in the livin room from? Thanks for sharing! Lovely home! 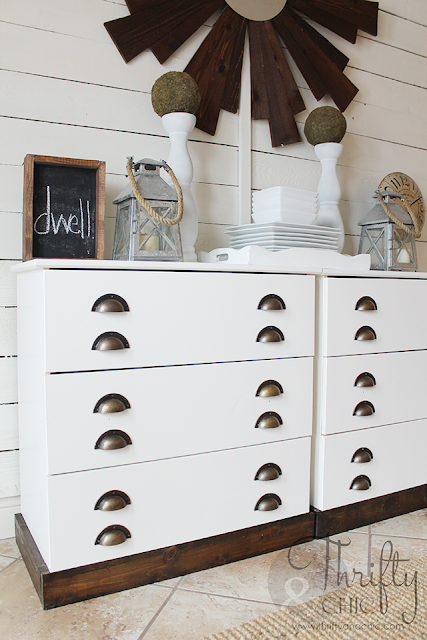 Would you please share which specific white paint you use for refurbishing furniture? Thanks. Love it!! 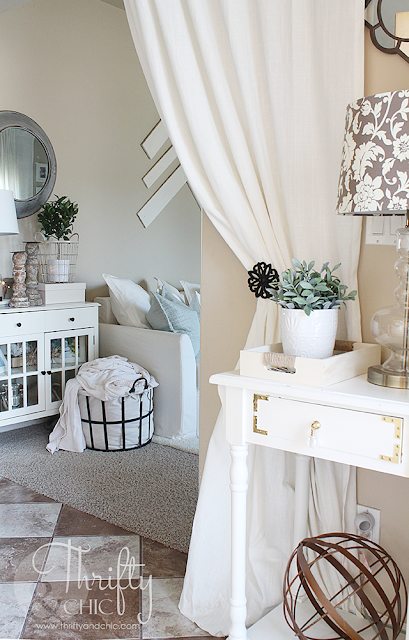 Where did you get your master bedroom bedding set? Love to know this too! :) Love it! I actually have two sets, the one on the bottom with the side ruffles is from Crane and Canopy, and the one at the foot of the bed is from Amazon. I actually have a link to it if you search on the top bar "Bedding Sets"
Looks a lot like our Avon comforter set. She did a breakdown of accessories at the end of the post by item (i.e. rugs) then with ea room. The details do make the room! 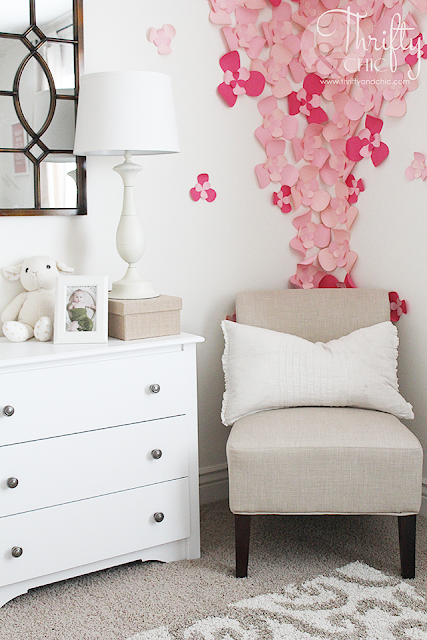 Love, love, love your home. 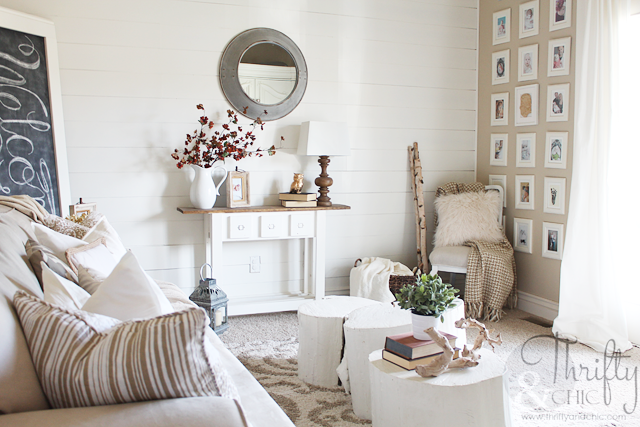 The decor is so peaceful and although you say its thrifty, its looks really classy! 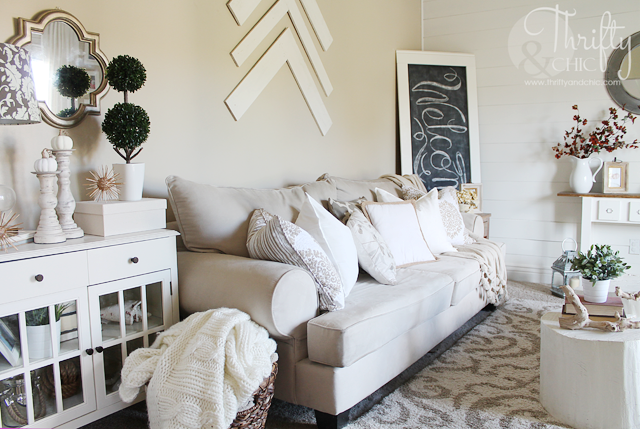 I had white slip-covered sofas in our family room when my kids were young - it was so easy to throw the covers in the wash every couple of months - always looked fresh and clean. Would love to go back to a white slip covered sofa! If you make your own like I do, make sure you pre-wash and dry before you start - then they will always fit. HI There - just wondering - where did you get those boxes under your sofa table? I have never seen prices like that at Ross. What day did you shop? The couch for $90 is quite a deal. What warehouse sale? Hi. 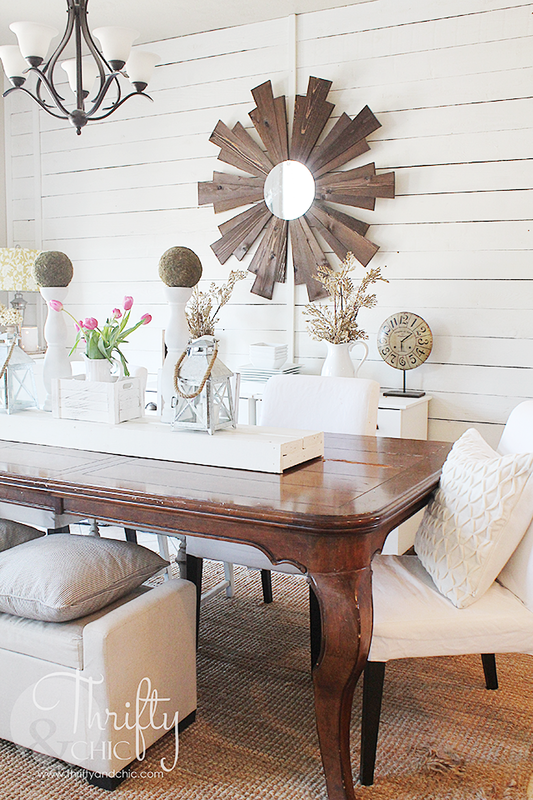 Can you tell me where the lamps on the white table are from? You are a real designer!!! I noticed you have wooden closet door and stairs. What are the rest doors and windows? I have all wooden doors, windows, stairs, trims and baseboards. They are yellowish and made the house look old. I am still debuting if I should get them painted all white. It will cost a fortune to paint all. I still like some wooden colour in the house. I like how your closet door blend in the pictures. Any suggestions? Thanks! Hi, I am new to your blog. 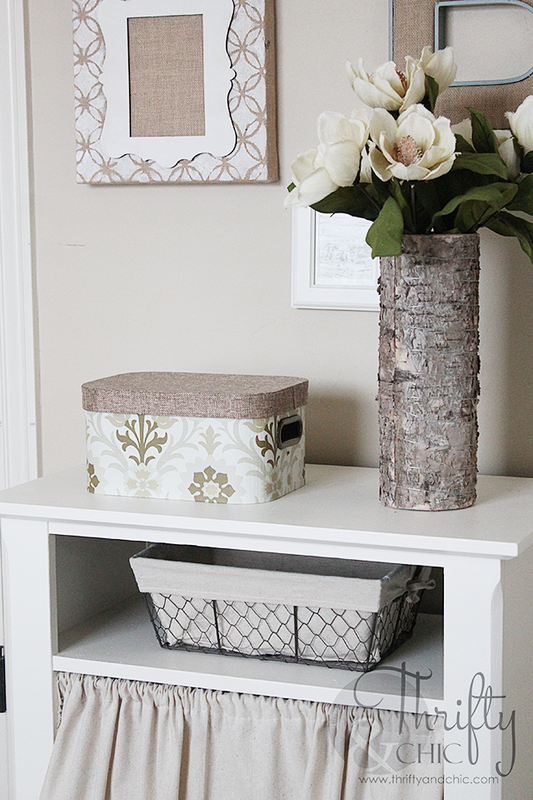 Your home is beautiful and your blog is very inviting! I have a few questions: How do you keep track of Promo codes and when an item gets marked down in store or online? Do you receive emails? How do you keep track of best time to buy certain items? Is there a certain time of the year or day of the month? Do you personally have a certain day of the week or month you go hunting for clearance/treasures? I will be coming back! Thanks! 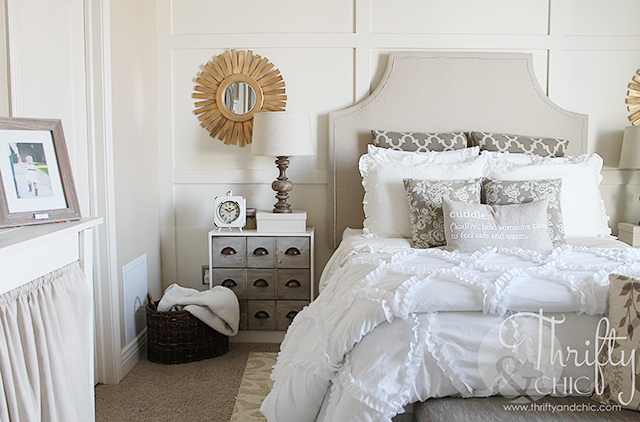 Where is your white bedsheets/bedspread/duvet cover in master bedroom for. I have been looking for these forever. Hi there! 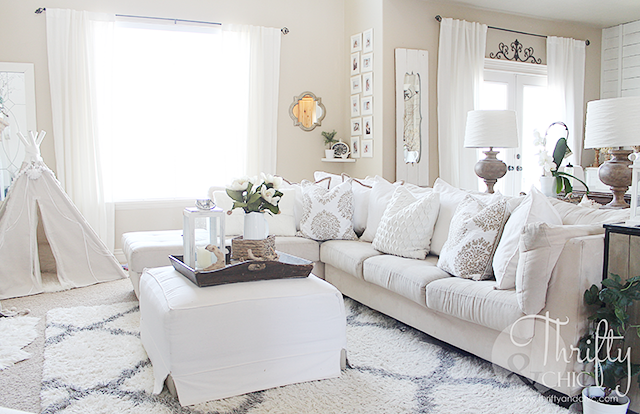 Could you share the style name of the rug in your living room from Rugs USA? Love it! Your home is beautiful! 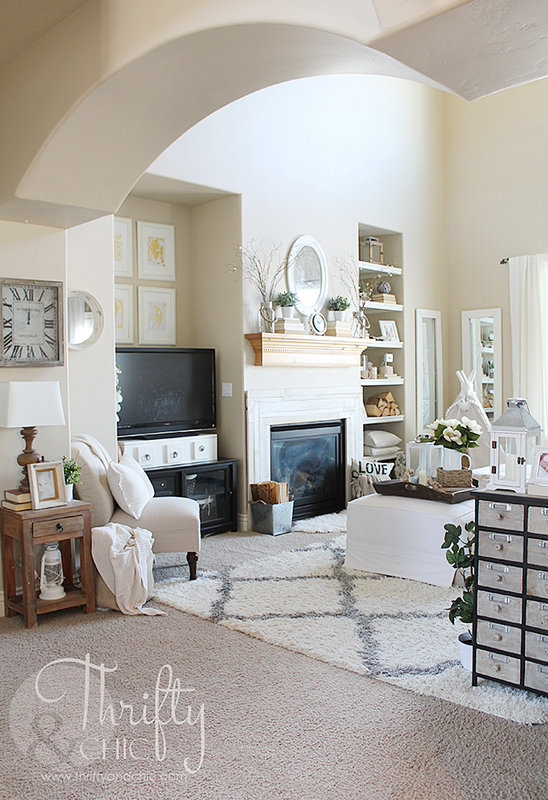 Do you use the living room a lot? Will the furniture stand up to all of the wear and tear over the years? getting the products i needed to design my room as great! I love the printed pillows on your couch. You said you sewed these yourself. Where is the fabric from or what is the brand of the fabric? Thank you! 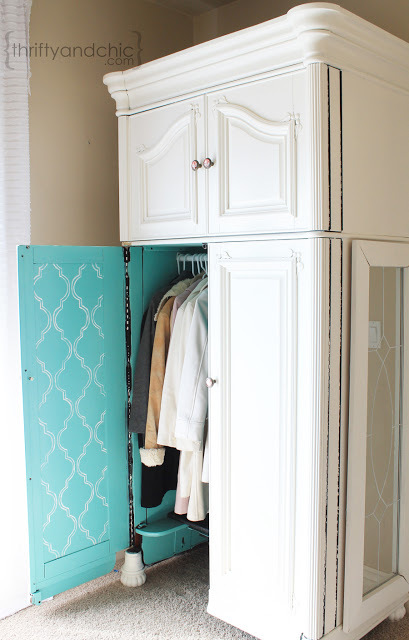 What is the paint color you used throughout? I do! I have two toddlers and a dog. Wow, this is inspiring! No, not all of us will be able to decorate our homes as inexpensively as you have, but I still find it amazing. We are getting ready to move into a new-to-us home, and reading this was good for me- helps me remember to think outside the box when looking for those decor items we'll need! You have a beautiful home and I love that you were able to make it welcoming and lovely without spending a lot. I love your website and name. Especially your font. I am designing my own business cards for my landscaping business and would love know what fonts you use in your title, if you don't mind sharing. Thanks! Great post. I found this on Pinterest. I can't believe that sofa for $90.00. Amazing. Just a tip for shoppers. Goodwill buys pallets of stuff from Target and sells them at discounted prices. I bought a brand new wooden kitchen table a teensy bit scuffed but perfect otherwise for $119 regular price at target $250. Same with a really nice storage bench tha t has sliding doors and a seat cushion. Target price, $169.99. Goodwill price $74. And there was nothing wrong with the bench at all. They employees were taking them out of their boxes and putting them together when I walked in. And I immediately bought the 2 pieces.